No one likes a power outage. They are inconvenient, stressful situation that makes anyone nervous. Now if you have a garage door opener you know how convenient and time-saving it is, as well as a great way to avoid back pain. You don’t want to have to open it manually, especially during a storm and/or power outage! During bad weather, it is a relief t open and close your garage door at the push of a button without needing to fight pulling the heavy garage door up or down. This way you and your belongings stay dry too! However, we all know that power outages happen, and you will still need to go on with your daily life. So here are some tips to get your garage door to open manually. Garage door openers all have a switch, known as a bypass switch, that is used specifically for power outages, or a motor not working, or a dead garage door remote. The garage door opener should have a rope that has a handle attached to it, normally this is red. This is a manual release handle that will disengage your garage door’s trolley from where it is attached on the rail. When you pull on this rope, the garage door will now pe in manual mode. Be sure to do this only if your garage door is down, as it may come crashing down if it is up and can cause injury. It is much safer to activate this when the garage door is closed for this reason. The red rope with the handle we mentioned earlier is the part that controls the trolley’s spring attachment. If your power is going to be out for some time, due to a storm, a malfunctioning motor on your opener, or any other reason, then you may want to keep it in manual mode for a while. 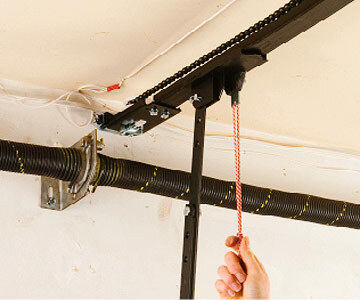 If you need to continually have your garage door in manual, then pull your rope down and toward the back of the garage, or your garage door motor, to prevent it from getting stuck in the garage door tracks. When the power comes back on or you locate your lost remote, you can lock the bypass and use the door normally again. Do not let go of the door once it’s off the ground. When your power is finally back on, what do you do to get your garage door back to automatic and out of manual? To get your garage door working as it was, pull the cord again, but instead of pulling backward, pull forward. This will keep the lever from engaging. That way you pull until it snaps back into it’s proper place and you will be back in automatic mode. You can do that, or you can simply hit the button for your garage door and it will force the spring attachment back to where it belongs. If you have trouble with your garage door, you can always call a garage door technician to come out and take a look! 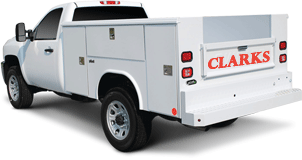 If you are looking for a garage door technician, look no further than Clarks Garage Door & Gate Repair. We offer all your garage door needs in no time, and any time you need us we are just a call away! Call (877) 622-8183 now for a free quote!